And here we have the cover for John Green's upcoming book The Fault in Our Stars, due out January 10th. I like how simple it is (yay for simple these days). I like that there are no people on it. And I like the chalk writing. It's a little hard to fall utterly in love with, however, because of the countless unbelievably awesome fan-made covers sent in. Happily, they impressed his publisher so much they're holding a contest for fan-made covers for the next edition of An Abundance of Katherines. I cannot wait to see the results! For now, I'm off to go pre-order my signed copy of tFiOS. How interesting that there's a cover quote from Jodi Picoult. Is it me or is that an odd choice? YAY! So excited for this one. Can't wait for my SIGNED copy! Oh my word, he is crazy. In a really really good way. Christine, yeah, that caught my eye as well. Not a name you expect to see on a John Green cover at all, is it? Suey, lol. He really is. Chachic, me too! Can't miss out on getting one of those. Maybe a yeti one! Oh, I've been waiting for this cover unveil! I too like the simplicity. It's actually a little non-descript for my taste, but maybe it will make more sense after I've read it. I'm off to preorder... What a great book to look forward to in early January. Oh wow, thanks for sharing this Angie, I haven't seen it yet The chalk writing is great. Holly, that's a good word for it--nondescript. I agree, would have liked it to make a bit more of an impression. Jo, yeah, I love the chalk writing, too. Can't wait. 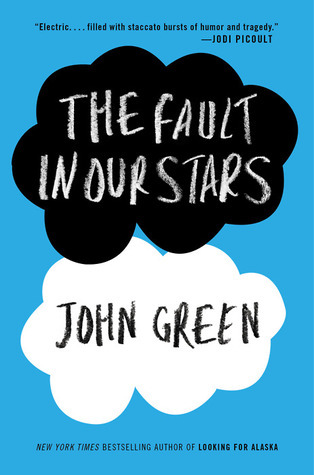 Oooh, a new John Green! How exciting. Better add to the wishlist now so I don't forget.